MEGA-LITE presents the Spotbot™ LED CYM 300, a new versatile LED fixture that is affordable, full-featured and all-purpose. 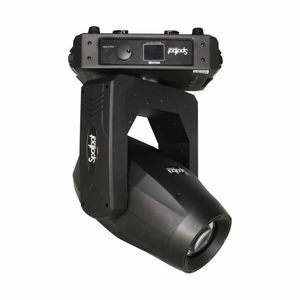 Equipped with a powerful 300W LED engine that can produce a bright and powerful even projection, the Spotbot’s™ impressive 7˚- 31˚ zoom range allows for the unit to be utilized in versatile settings. When combined with the 8 facet rotating prism the gobos seem to come alive. It has multiple glass gobos that provide high-level projected imagery and can generate complex looks. The 10 fixed and 7 rotating gobos allow you to morph between them using the focus and zoom. Separating it from entry level units is its different colors. The smooth CYM color mixing allows for multiple color combinations. It also offers a unique set of added colors that reside on the back end of the CYM color flags. With the ability to generate a multitude of color sequences the Spotbot™ also features a frost filter for a colorful, smooth soft-edged wash. The one independent frost effect enables an effortless switch to an even wash, making it ideal for theatre usage. The Spotbot™ LED CYM 300 is the perfect multi-tool, robust, full-size fixture to have in your lighting tool chest. It is a multi-purpose lamp that can be used in large or small venues for concerts, clubs or theater and remains a highly economical fixture compared to others in its class. The Spotbot™ is the ideal LED, CYM, frost, zoom, spot fixture.